The first military engagements that were fought during the American Revolutionary War were the Battles of Lexington and Concord. They were both fought on April 19, 1775. So when the Second Continental Congress met on May 10, 1775, everyone sensed the urgency to declare independence from the British. However, at the time, few delegates were willing to advocate for something as radical as independence from the mother country. Instead they hoped that there could be some kind of reconciliation. John Adams led those that preferred separation from Britain. He stated that the cancer (British corruption) was too deeply rooted and too far spread to be cured by anything short of cutting it out entire. At the time, Farmer John Dickinson was not in agreement. He advocated paying for the tea that was destroyed in Boston, and said it was British Parliament’s right to control our trade. Farmer John also advocated asking parliament one more time to redress our grievances. Adams told congress that we might continue with a relationship with the king, but parliament should not play a part in how America was governed. Soon afterward Congress authorized the raising of an army, and George Washington would be in command. 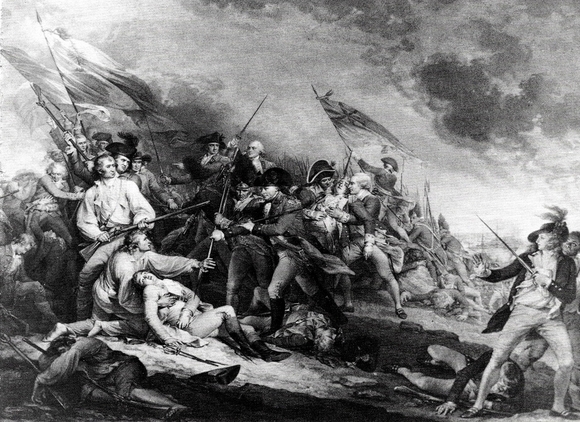 Then just a couple of days later both sides met in the Battle of Bunker Hill. By now, too many had been killed and the hope of peace between the colonists and the British had been dashed. Word quickly spread that the colonies were in a battle for independence. Soon after, men from the middle and southern colonies began arriving in Boston in droves to join in the fight. The great Thomas Jefferson arrived in the capital of Philadelphia just as news of the Battle of Bunker Hill arrived. Congress asked the tall red head Jefferson, Farmer John, Benjamin Franklin, Connecticut's Roger Sherman, John Adams, and New Yorker Robert Livingston to draft a “Declaration of Causes and Necessity for Taking Up Arms”. They all met in the new home of Graff, the bricklayer, at Seventh and Market streets. It was probably Benjamin Franklin who suggested that the document be placed in the hands of the best known writer in Congress, Thomas Jefferson. Jefferson spent days in the Graff house borrowing heavily from his former writings, as well as the the writings of John Locke. At the time, Thomas Jefferson was just 33 years of age. By June 28, every colony but New York had voted to have their delegates authorize independence. When Congress met again on July 1, 1776, the majority of delegates were in favor of independence. However, they were unable to come to any conclusions. The next day more delegates appeared, some even riding all night in driving rain. On this day the support finally shifted toward independence. Then on July 4, 1776, Congress met in sweltering heat in a packed session in the statehouse in Philadelphia. Carefully, they began to dissect the words of Thomas Jefferson. Then, the upheaval really started when they got to the passage where he denounced the institution of slavery. That phase and a few others did not make it to the final draft. Congress ordered the Declaration of Independence to be written on parchment. Then, the idea of an official seal was discussed. Again John Adam, Thomas Jefferson, and Benjamin Franklin were given the task of creating an official design for the new nation.